*Grandma Doesn’t Have A Logo! I think most people are under the mistaken impression that they need to have a cutesy logo or something in order for me to paint them a tile. Unfortunately, I’m probably to blame for that notion because of how I chose to announce my custom tiles when I first started out. I’m now here to tell you differently! 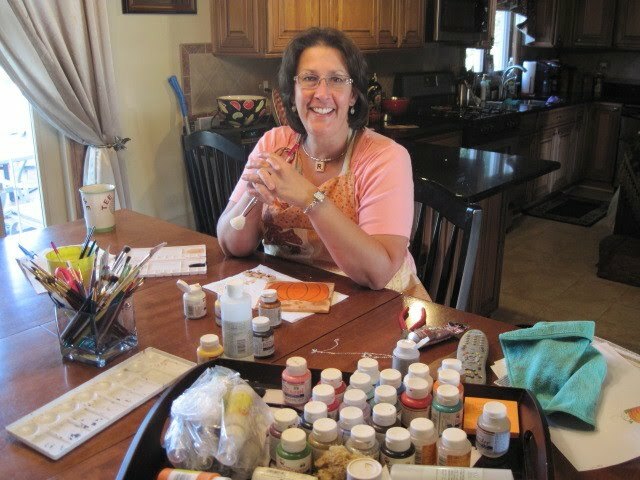 As long as you have an idea of what you’d like painted on a tile, that’s all I require to design a custom piece made just for you, or someone you love! Just last week, I was emailed by a young mom who was requesting a quote on a custom tile. She was looking for a unique and personalized gift for her mother, who is also the grandmother to her two young daughters. 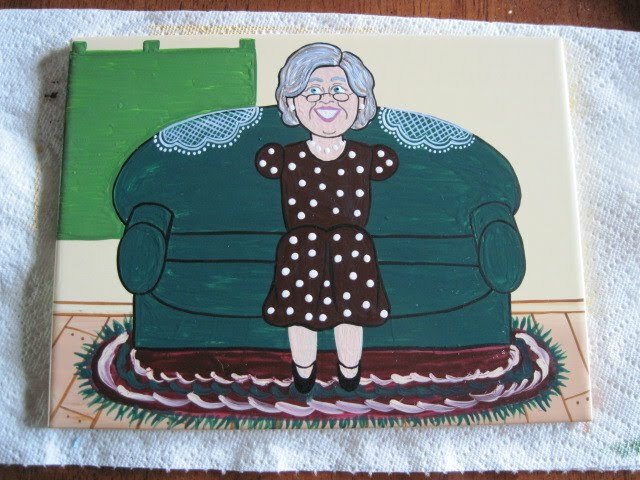 She had found out about my hand painted tiles after recently seeing the I’m Lovin’ It Friday post on Tidy Mom’s blog. The only other bit of information I received from that initial email was that her mother loved to read to her granddaughters, and that one daughter is blond and one is red headed. I was immediately intrigued with the concept and soon design ideas began dancing around in my head. After determining her budget, I sketched a quick picture and emailed her back with a concept that I thought would work well, be cute, whimsical and unique. See? I told you it was a quick sketch but at least it was something I could show her so she could better understand the design that was flashing around in my head. Unfortunately, this wasn’t exactly what she had pictured in her own mind and she asked if I could add a bit more detail along with giving grandma an updated look. 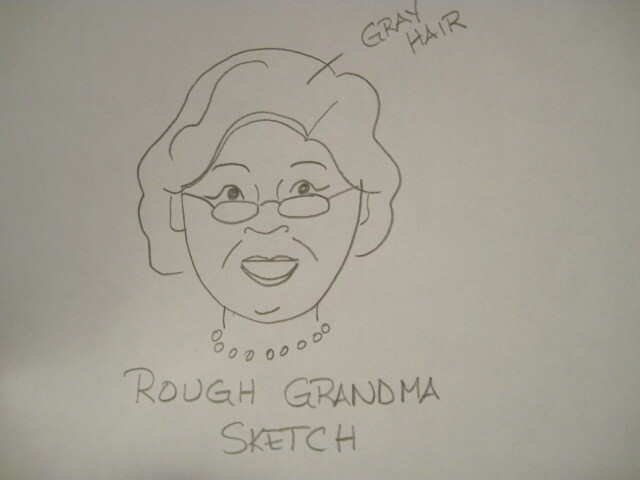 Another quick sketch emailed to my client and now grandma didn’t look so much like granny Clampet! Huge relief! 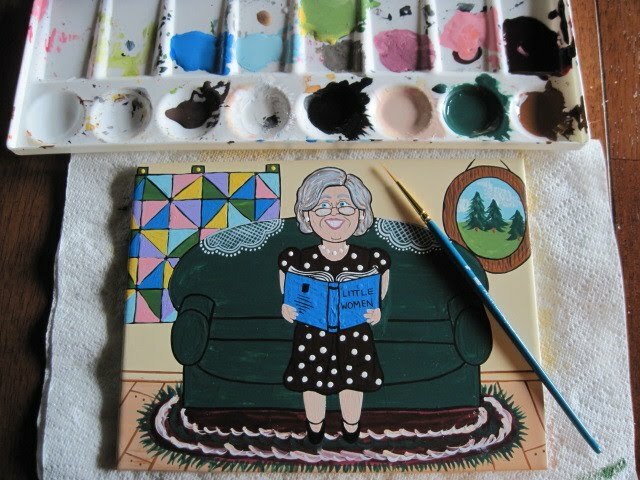 The go ahead was given for me to incorporate additional details into the design and soon I had gathered a bunch more information about grandma, her interests and her home decor. The background always comes first and I need to keep it light and bright. 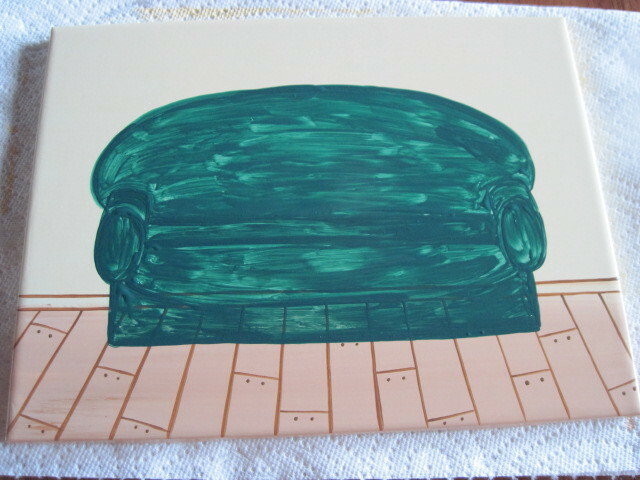 The couch in grandma’s living room is a deep dark green and it’s where the three of them spend most of their reading together. Grandma’s kitchen is a space that opens to her living room. The color maroon also accents these two spaces so I decide to add an area rug on the floor and also have grandma decked out in a maroon color dress with white polka dots, just to jazz her up a bit. Grandma is a quilter, which is what that large green square in the background is going to be. I then took it upon myself to add doilies to the back of her couch. 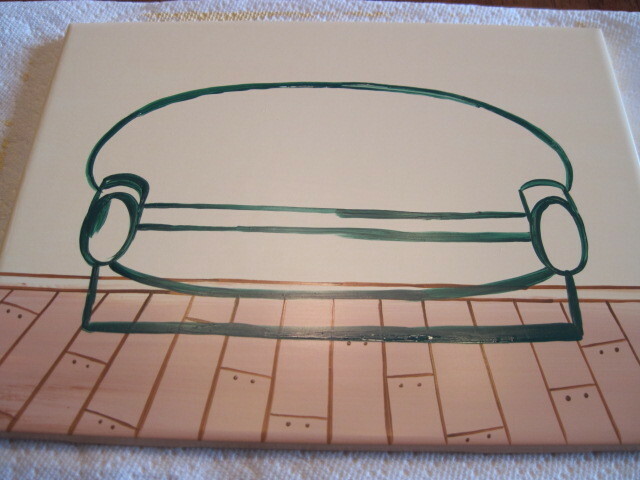 After all, what grandma’s couch would be complete without them? LOL. Sorry you modern day grandma’s. Maybe back-in-the-day that was the norm, but not so much now. However, I felt it would be a nice homey touch. The additional details are coming along nicely and you can see the home decor items are really starting to add warmth and charm to grandma’s home. 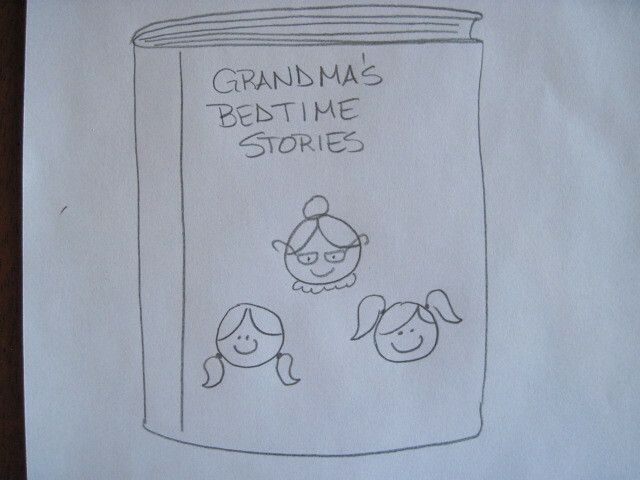 If you look closely, you can also see the book grandma will be reading to her two young granddaughters. Somehow I just felt it was appropriate. Grandma’s granddaughters are aged 6 and 4. The six year old has red hair, hazel color eyes and loves the color purple. The 4 year old is blond, has blue eyes and her favorite color is pink. Now I know there is an extremely slim chance that the actual three ladies will look anything like what I depicted in the tile, but I think that’s part of the charm this young mom was after. 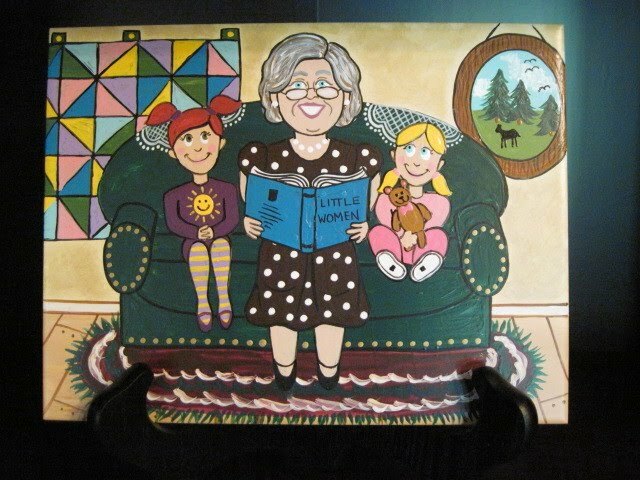 It’s personalized in such a subtle way to grandma and her young granddaughters that the whimsy factor goes through the roof. 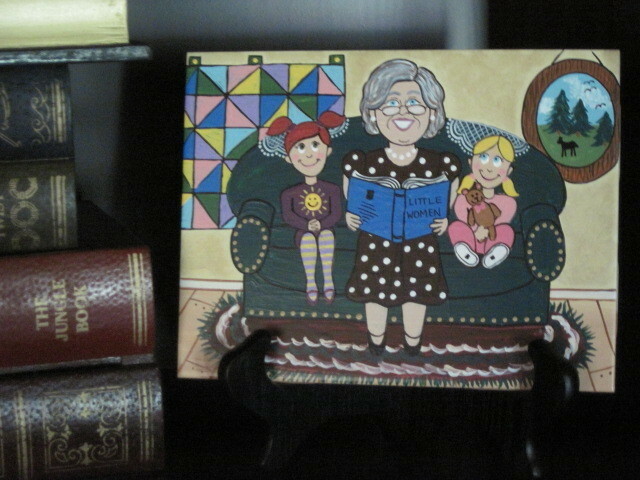 I know for certain it will be a piece grandma will treasure forever on her bookshelf and will be a definite conversation piece when friends and family come to visit. Kudos Grandma! Enjoy your special custom tile that was designed especially for you! 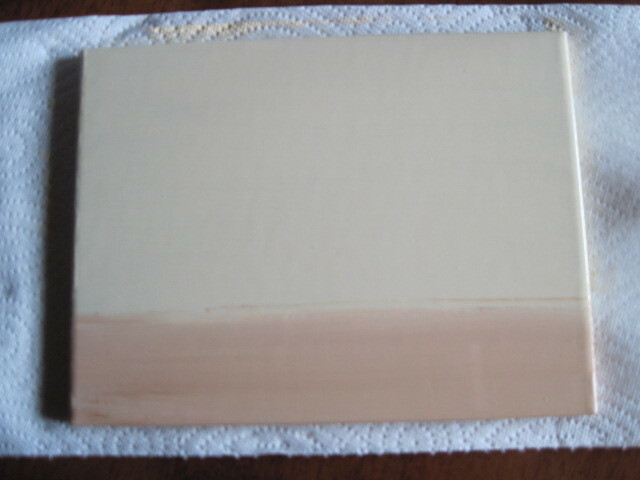 I’d love the opportunity to design and paint a custom tile especially for you too. Please email me at: info@kudoskitchenbyrenee.com for a design quote. It really is very cute and the story behind it, the way you tell it, is charming. Something coming to life. Lovely! She'll love it! OMW I love this!! I know your customer is going to go bananas for it, too – she just has to! I just love this!!! as soon as i have some spare cash im sending it your way!! i cant wait to get one! This has got to be my favourite tile to date! I love how you brought this tile to life. The little details are what makes is so charming and the lace doilies on the back of the couch are amazing in their detail. Very interesting reading how you came up with ideas and then showing the different steps to the final product. It is so cute. Loved it! Kudos you are SO TALENTED!